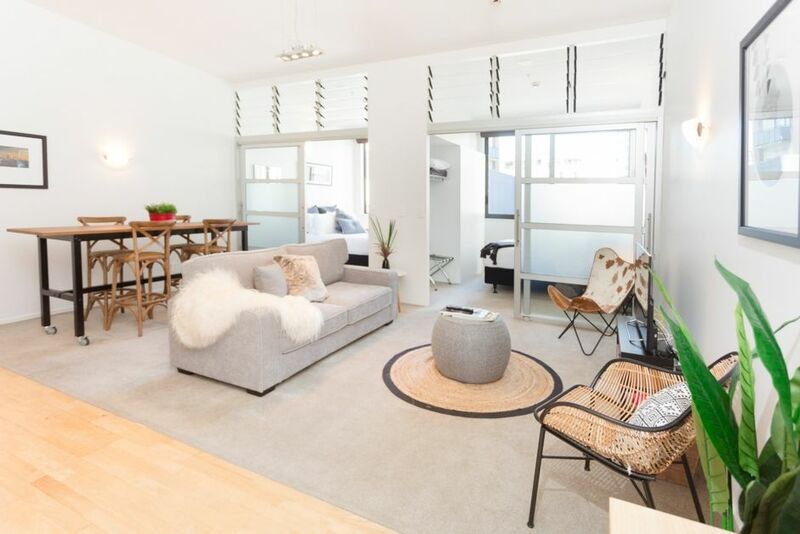 This apartment is the perfect for those wanting a bit of yin and yang during their stay in Auckland. Enjoy the tranquility of being located on the top floor of the building and away from the street which means that it is wonderful and quiet. Step outside however and you are just a short stroll from Britomart, the Waterfront, Spark Arena, Waiheke Ferries and all of the best restaurants, bars and attractions Auckland has to offer. The kitchen has modern cooking facilities and is completely self-contained - did anyone say breakfast in bed! There is coffee, tea, sugar, milk, cooking basics and we always leave you some tasty snacks to enjoy. If cooking isn't your thing, then venture out into the neighborhood's vibrant atmosphere and you will be just a short walk away some of Auckland's best places to eat and drink. Lost keys incur $150 replacement costs plus any locksmith costs should you lock yourself out. Strict no party policy. The apartment building management stipulates no parties but fortunately there is an array of pubs, clubs and restaurants within 10 mins walk away. The property is smoke-free; there is a $1000 fine for any smoking in the apartment. Modern, well furnished and awesome location - the perfect home away from home! Paul and Emily were great to work with and the apartment was exactly what we needed after a 13 hour flight. We have stayed in many privately owned apartments/houses and this one was well stocked, very clean, and perfect for a family. Reserving the car park is a must. The small amount of extra money takes out the stress of parking when hauling luggage to and from your car. Thank you Paul and Emily for your hospitality! The place was very clean and well organized. They left some food for us which was very nice since we came in late and were hungry upon our arrival. I was traveling alone and found it to be impeccable. The space was comfortable, well appointed and in easy walking distance to interesting sites. Great place with everything we needed. Great for families with younger kids, privacy wasn’t the greatest for teens or groups of adults. Thank you for staying with us. We hope you enjoyed the apartment - we would be delighted to host you again next time you visit. Thanks again. Kind regards, Emilie. Great location, very tidy and well equipped apartment. Lovely apartment, that was well appointed.